The SRX3600 Services Gateway is a market-leading security solution supporting up to 30 Gbps firewall, 10 Gbps firewall and IPS, or 10 Gbps of IPsec VPN along with up to 175,000 new connections per second. Equipped with the full range of security features, the SRX3600 is ideally suited for securing medium to large enterprise data centers, co-located data centers, or securing next-generation enterprise services/applications. It can also be deployed to secure service provider infrastructures as well as for securing next-generation services. 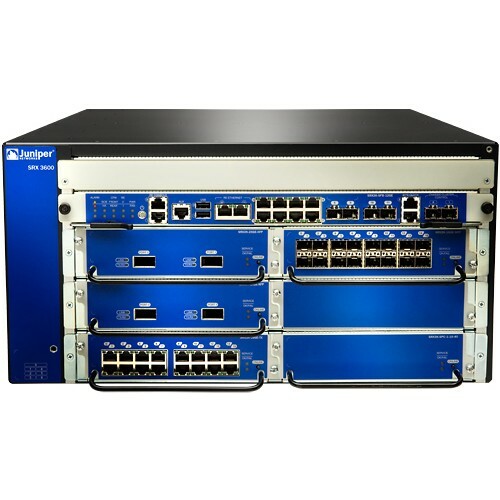 The SRX3600 Services Gateway is managed by Juniper Networks Network and Security Manager; the same management solution used in all Juniper Networks firewall, IDP Series Intrusion Detection and Prevention Appliances, SA Series SSL VPN Appliances, Unified Access Control, and EX Series Ethernet Switches.